I am experienced in carrying our assessments and I treat a wide range of mental health difficulties tailoring my approach according to client needs and requirements. I can offer a space where you will be listened to and where we can collaboratively gain a clear understanding into what is troubling you. By taking account of past events, behaviours and thoughts, I can help you to find a way to move forward with your life in a more positive and helpful way. 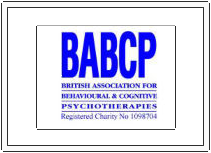 I am a fully qualified Cognitive Behavioural Therapist (CBT), accredited with the BABCP (British Association of Behavioural and Cognitive Psychotherapists) and also am a qualified Person-Centred Counsellor/Psychotherapist, and have accreditation with the BACP (British Association of Counsellors and Psychotherapists. I therefore work to the ethical guidelines and principles laid down by these organisations. Cognitive Behavioural Psychotherapy (CBT) and Counselling service in Chester, Cheshire.